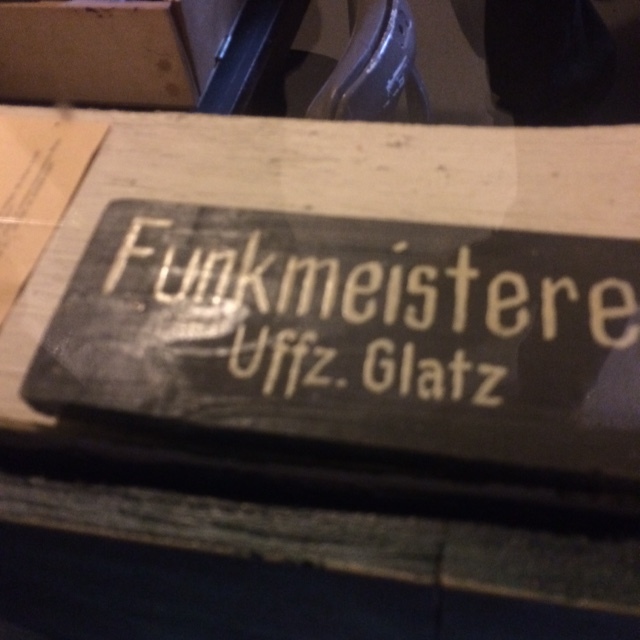 A label from the reconstruction, sadly not of a German disco, but a wartime observation post. This Easter I finally managed to visit Bletchley Park. And left wanting to return. It’s a hodge-podge of experiences, a legacy of the site’s struggle for recognition, and then funding. Many individuals and organisations have worked to preserve, open and support the site, and one gets the feeling that some don’t work brilliantly with others. So the National Museum of Computing for example, rents space from the Bletchley Park Trust, but operates as a separate entity, with a separate fee (we didn’t go in). Even within the Trust’s own pay-perimeter, modern, minimalist museum quality reconstructions and interactives jostled for space alongside enthusiasts’ collections of (for example) carrier pigeon memorabilia. We were one of the last cars allowed into the car park, before thy closed the gates and directed people instead to the nearby railway station for park. We had to queue for some time, to pay our admission, though I have to say, the staff were very efficient at processing the crowd, and we were taken to the shop’s till to buy our tickets, while other families in our (large) party were dealt with at the normal admissions points. The initial reception building was bustling with people, and with aged relatives in tow, we took respite from the crowds with a grab-and-do drink and sandwich lunch and a sit down in the Block C cafe. We didn’t spend much time looking around the exhibitions in Block C but sought out instead the narrative heart of the story: the codebreaking Huts 3, 6, 8 and 11. (An aside – a family friend, Val Knight, worked at Bletchley during the war in Hut 7, which sadly seems to no longer exist.) It quite gratifying to walk into Hut 8, and the first thing you see is a panel explaining that Alan Turing’s office is though the next door. There were some great interactives in Hut 8 too. I was particularly impressed with four tables, that explained probability, with more and more variables, from flipping a coin, through rolling dice to drawing Scrabble letters. These interactives came into their own on this busy day, each one was short enough for users to get the point very quickly and move on. The only difficulty I observed was a tendency of users to replicate the finger pointing habits of modern smart-phone users, when the system required users to use their whole hand to make their choices. From that point on though, the interactives had to explain more difficult concepts, and I observed users sightly impatiently “helping” each other, while others were struggling to get their head around the activities. In hut 11 I found myself stumped by a couple of interactives (one of which, I realized later, was actually out of order) and with the press of people politely waiting behind me to have a go, I had to leave “the Bombe” un-configured (and likely lost the whole second world war). Cryptography is a complex business especially if, like me, you aren’t a particularly brilliant mathematician, and I left the place, a) slightly frustrated that I hadn’t understood as much as I wanted; and b) determined to go back for a quieter mid-week, non-school-holiday visit. I wasn’t sure that our aged relatives would make it as far as the mansion but we managed to have a look at the costumes and props from the recent Bletchley/Turing film The Imitation Game, before heading back down the hill to what felt like an older set of museum galleries in Block B. The exhibitions here, were wordy but professionally produced, somewhere between the sublime minimalism of the Codebreaking Huts and the enthusiasts’ collections. Here though was where the importance of the enthusiasts in the development of Bletchley as a visitor attraction was most evident: a working rebuild of a Bombe, was being operated and interpreted by experts the like of which no organisation can just go out and hire. And they had the biggest crowd of the day gathered around them. Again, I’d like to visit on a quieter day to better hear and see what they were explaining. What impressed me most about the site as a whole is that we took a large group of diverse interest, male and female, geek and casual, from 10 to 87 years old, and everybody, but everybody found plenty to enjoy.